The whole of FATA is under either the direct control of law enforcement agencies or the terrorists, with official check posts and the hideouts of terrorists operating side by side. The people of tribal areas bordering Afghanistan are caught between the Pakistan army on one hand, and the Taliban and ISIS on the other. The terrorists attack and kill tribal leaders for not allowing them to set up their training centers and move freely in the mountains, while the Pakistan army arrests, tortures, and extrajudicially kills civilians during anti-terror operations, such as Zarb-e-Azb. 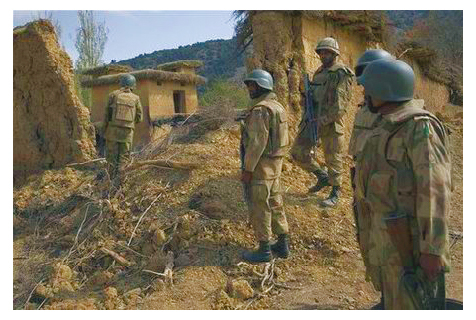 In Mohmand Agency, hundreds of houses have been demolished on the suspicion of residents having links with terrorists. Several houses have been demolished by paramilitary forces on the suspicion of locals providing accommodation to the alleged terrorists when they cross the Afghan border into Pakistan. On the other hand, local media reports suggest that terrorists generally come in the night and force the inhabitants to provide indefinite accommodation. For this purpose, they use the tradition of Pakhtoon Wali, the centuries-old tradition of hospitality thought to be the Islamic way. If anyone resists this tradition, the terrorists keep the entire family hostage for several days. Local residents cannot help but wonder how law enforcement agencies only come to raid homes after occupying terrorists leave those homes. Why do they not arrive when terrorists operate freely in the locality? On 19 November 2016, the political administration in the sub-district of Saafi, Ziarat, in Mohmand Agency, has banned the mining of marble to ensure law and order on. This decision has been taken despite about one hundred thousand persons from military and other forces being stationed there. This ban has rendered thousands of people jobless. The political administration in Federally Administrative Tribal Areas (FATA) falls under the President of Pakistan, but, virtually, things function on the instructions of the Military, since operation Zarb-e-Azb began in 2015. There are seven districts and six Frontier Regions (FR), which run up to the 2,500 km long Durand Line, the frontier between Afghanistan and Pakistan, established in 1893 by Sir Mortimer Durand, a British diplomat and civil servant of British India. Throughout the FATA region, there are periodic check posts maintained by the army, paramilitary forces, and local law enforcement agencies, known as Khasdar. There are also hideouts of terrorists from the Taliban and Al-Qaida, which have merged into the international terrorist organization, ISIS, known as Daesh in the Muslim world. The local population is thus trapped between law enforcement agencies (LEA) and terrorists, both of whom punish locals. At the same time, both the LEA and terrorists have a policy of co-existence that has rendered the life of 150 million people into one of misery. The terrorists treat civilians as touts of the military, and the LEA think they are the facilitators of terrorists. All the homes are built using remittances sent by menfolk who work for many years in Middle East countries, as there is virtually no productive activity in the area except mining or smuggling of small items. Despite this, after such demolitions, the federal government or political administration do not pay any compensation to the affected families. After the massacre of children in Army Public School on 16 December 2014, a National Action Plan (NAP) was made to combat terrorism. It was also mentioned FATA will be developed and terrorism in Punjab will be eliminated. However, no development was initiated in FATA, nor were terrorist hideouts in Punjab eliminated. In different agencies of FATA, the political administration calls Jirgas (tribal council meetings) to seek support for the demolition of houses suspected of hosting alleged terrorists. On November 10, the Khassdar force demolished more than eight houses in a big compound using heavy machinery, in the Darwezai area of sub district of Pandialay, Mohmand Agency. The reason for the demolition was that residents provided hospitality to a Khurasani. The Khurasani word is now used as synonymous for the word terrorists due to Umer Khalid Khurasani, who is a fugitive in the hierarchy of Daesh. However, the residents say they do not know about the affiliation of any guest; as per custom of Pakhtoon Wali, the guest can stay in any house. Regardless, why should a significant number of women and children be punished for someone staying at one of the houses? And, no one, neither the political administration, nor the LEA, has taken responsibility to rebuild the homes. It must be mentioned that the local people of the Mohmand Agency have for long resisted the Taliban and other religious and sectarian terrorists, including foreign terrorists, and have sacrificed their lives towards. It is on record that terrorists have killed about 58 tribal chiefs. These chieftains had made peace committees and were keeping peace in their areas of influence. Prominent among these chiefs (who are called Malaks) are Malak Darra Khan, Malak Haji Zahir Shah, Malak Mir Syed, Malak Adam Khan, Malak, and Mirza Alam Khan Wazir Zai. Now all these areas are under military control, and the residents are under suspicion of having links with terrorists. The latest political order banning the mining of marble in Saafi District, for residents allegedly failing to maintain peace in the area, is yet another burden placed on locals. While the area is under the complete control of the Frontier Corp and other law enforcement agencies, the failure to maintain law and order is placed on the people. The marble excavated from Ziarat, Saafi, is recognized as good quality as Italian and Turkish marble, and thousands of families depend on the mining of this marble for their livelihood. Local activists say that mining of marble will soon be taken over by LEA from Islamabad. In Darr-e-Adamkhel, affiliated with the Kohat Frontier Region, where coalmines are found, people have been prevented from earning from coalmines; the Military has claimed control in the area and LEA personnel are extorting money from locals. Those activists who raise their voice for the rights of locals are accused as being terrorists or Indian agents. Kurram Agency is also facing a terrible situation in the hands of assorted terrorists, Taliban, and Pakistani law enforcement agencies. A good number of the inhabitants are from the Shia sect of Islam, who are treated as infidels by the Taiban. The whole Kurram Agency is under the control of the Haqqani Network, a very powerful international terrorist organization that carries out terrorist activities inside Pakistan and Afghanistan and has been involved in the killing of NATO forces. Despite the entire area being one that is supposedly under control of the Frontier Corps and Pakistan army, all the roads leading to Peshawar, capital of Khaiber Pakhtoon Khwa Province, particularly Thall Road, is under the control of the Haqqani Network and the Taliban. So the people of Parachinar have to go into the territory of Afghanistan and then re-enter Pakistan, taking a very long route, to reach Peshawar City safely. The Shias are fifty percent the Parachinar population. The people living by the 2,500 kilometer Durand Line are caught between the devil and the deep blue sea. The space for civil society has been at the minimal level, no space for free movement and free discussions. There is no rule of law but the law and order is rule of the time. The law of law enforcement agencies and terrorists are prevailed.